There's something so powerful about a platform boot in the blackest of black. But not all boots are created equal. Some cost nearly $500 while others are bit more affordable for the average human being. We're back with another round of Splurge or Save. 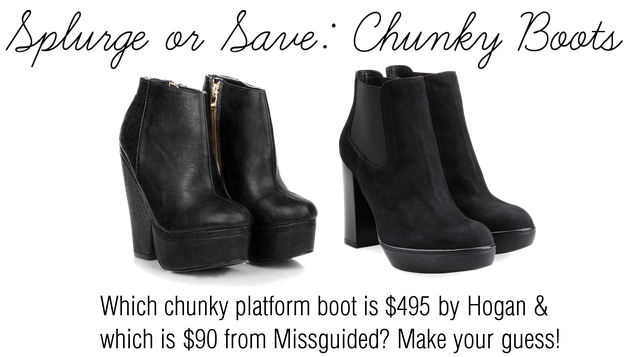 Your mission today is to figure out which chunky platform boot costs $495 by Hogan & which is the $90 boot from Missguided. Make your guess! No peeking. Finalize your guess before you read further. Let's test your fashion skills. Well, the $90 Missguided boot can be found on the left while the $495 Hogan boot is on the right. How did you do? Did they fool you? Hogan Platform Ankle Boots retails at $495. It's got a round toe, tonal stitching, front platform, elasticized side panels, & chunky stacked heel. For me, the only negative is that it's made of suede (& the fact that it's nearly $500). 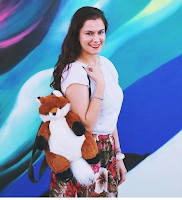 The elastic sides are perfect to easily put the boots on with none of the zipper hassle. Is it just me or does the zipper somehow always manage to get stuck? Now take a look at the Missguided Nanami Snake Print Platform Boots for $90. Faux leather with a 14cm/5.5in height to give you a hefty boost. Oh but don't worry, the platform height is 4cm/1.5in to make your feet feel a little bit better. I really like this pair. They look more expensive to me; although a bit too high for me to wear on a daily basis. Hooray for the faux leather. Yippee! They are both so beautiful! I love both really! I honestly thought the Misguided one is the one from Hogan because it looks so much more lavish! But gah, gotta love a good pair of chunky boots! I prefer de first pair :D Just perfect! I love this boots! To be honest, I had to read before I knew which one was each. I agree, it's definitely classic & I prefer the lower platform, but it ain't worth $500! Of course I like the ones on the right better... haha Actually H&M has a dupe for them that is absolutely identical! Frankly I love them both but I ain't paying $495 for a pair of boots, that's just bonkers! LOL! I love these kind of shoes. Top post! This was fun to guess! I actually guessed correctly...the heels on the right shoe look like they're made of a bit nicer materials....but I don't think I would spend $500 on shoes when I can get the next best thing for so much less! Aw I got it wrong this time. But I think both pairs of boots look great! I guess I got the save and Splurge correct! I like The Hogan ones better, but it's just because of the textures, the color contrast, although all black, is more noticeable. I liked that! You're a good glife guesser, Denise! I guessed right! I actually like the Hogans a little more than the Missguided boots. The suede I can live without but otherwise, love! Yeah not too thrilled with the suede. The missguided one definitely does look more expensive -- that was my pick! They're a beautiful pair of shoes but are too high for me unfortunately. Naturally, the pair I would have picked is the pair that's almost $500! haha Story of my life.